The historic Hollinshead Barn is an intimate setting suitable for meetings, corporate retreats, family gatherings and small weddings with less than 110 people. The former homestead operated from 1939-1983 and is located in 16.5 acre Hollinshead Park. The barn is surrounded by open pastures and orchard-like groves of trees. This multi-use park has a large community garden, off leash dog park and natural areas. 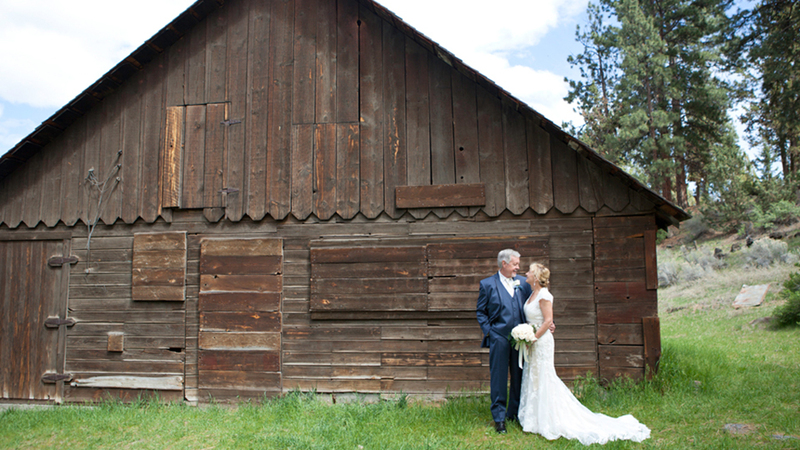 The country-like setting of the barn is an ideal event location and is located just minutes from downtown Bend. The renovated barn has gorgeous hardwood interior and two stories to accommodate your event. The first floor includes a small kitchen, restrooms, coat closet, telephone and elevator access. French doors open to exterior patios in the front and back. In the back of facility, there is a large propane barbecue and benches. The outdoor space and event lawn is a dedicated, fenced-in area and gives you privacy for your guests and event. The second floor has high, vaulted ceilings which are great for acoustical music or an intimate event. There is a sink with a small counter area and handicap elevator access. A great place for getting ready before the wedding or dancing later on in the evening. Capacity on the main floor is 55 with reception-style setup with tables and chairs OR 120 people in theatre-style seating with chairs only. Upstairs, has a maximum of 49 people regardless of setup due to fire code.